From gorgeous florals by Fluid Bloom, to fun cocktail hour visit from Paco the Sloth, Rava Wines hosted this timeless and memorable day, while Amanda Holder Event's pulled together organic, and timeless details to better show the bride and groom's style. Keep reading to hear more about the day, as well as Sydney and Derek's love story. Derek and I met the day after moving into our freshman dorm in September 2009. We were both residents of Muir hall, which at the time was the math and science dorm at Cal Poly. After joining our hall council, we became fast friends. Entering our third year, Derek had sent me a text a little too late at night on his 21st birthday expressing his crush on me. After a few weeks of awkward interactions, we finally started dating. Following graduating, Derek and I moved to Seattle and learned quickly that a good rain jacket makes all the difference and coffee can get you through any day ( week, month, 3 months straight) of rain. On our fifth dating anniversary in December of 2016, Derek asked me to marry him at a quiet restaurant we both love a block from our home. I was honestly so surprised ( I HAD NO IDEA), Derek requested a verbal yes to make sure. Organic Romance was the phrase that Derek and I felt really encompassed our wedding inspiration. We wanted an elegant, romantic and natural feeling without a lot of fuss. We went with a beautiful sage green pulled in from the vines and olive trees surrounding our venue, and touches of champagne to add elegance. Derek's father married us which was my absolute favorite part of the day. Derek and I wanted someone who knew us well and would make our ceremony feel truly authentic to who we are as a couple. His dad was the perfect person to lead our ceremony. Having his own personal stories included from the time he had spent with us was a beautiful touch, I didn't realize it would make it so special. My second favorite detail was our guest " book". Derek and I had a Cal Poly Flag for our guests to sign. We felt it was a clever way to share where we met and how much going to Cal Poly meant to us. While only a handful of the overall guests went to school with us, everyone who signed was now a part of our Cal Poly romance. PACO! Derek and I had Paco the Sloth as a guest at cocktail hour. Being able to feed Paco some snacks and see our guests enjoy meeting a sloth for the first time was a true highlight. My second memorable moment was our first dance. We didn't practice before hand at all but had SO much fun dancing to Michael Buble's rendition of "Save the Last Dance For Me". We wanted it to be fun and set the tone for the rest of the evening and I think it really showed. Derek and I LOVED all of our vendors. All of them. Amanda Holder Events: If I could just be friends with then for the rest of my life I would. They are such and amazing group of badass women who made my day absolutely perfect. Weddings by Scott and Dana: our photographers. They were the easiest vendor to choose. Dana and Scott ( the other S & D as we joked) were so thoughtful and truly caring from the moment we first spoke to them on the phone. 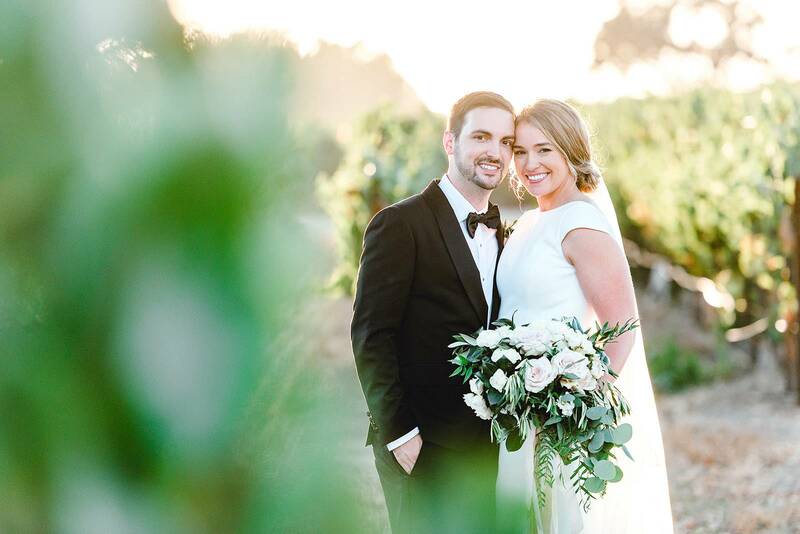 They provided such great information leading up to the day and were so incredibly communicative that I felt like we had known them well before meeting them the night before our wedding. Brit Tarr: Seriously the sweetest person. She made me feel so beautiful on my wedding day and helped me create look that fit my style and personality better than I could have dreamt. Sofia Gonzalez, Natural Dye Artist: Sofia hand dyed all of the ribbon that was around our venue and bouquets. She and I worked closely on creating a one of a kind champagne color to tie in everything and add the organic feel I wanted for our day. Fluid Bloom Designs, Nikki Caldwell: the flowers really speak for themselves. I wanted to have greenery and florals that were fitting of the venue and looked timeless. She nailed it. Pacific Animal Productions, Paco's Keepers: Will and Jen were AMAZING! They were so kind and informative about Paco and the other critters we had at cocktail hour. Mistura Catering: Our food was to die for. I may be bias, but I truly believe we served the best "wedding" food I've ever had. Jackeline's team made sure that our wedding party and parents were treated like guests of honor. The second Derek and I finally were able to sit in splendor, we were delivered a full plate ( we decided on family style service) with a little bit of everything for us to try. The menu they created ( seafood paella, WHAT?!?) was delicious and gorgeously plated. My one regret a was not running to the back to thank their team for doing such a great job. Copper and Crystal: Our party people. They were so professional, kind and FUN. They went above and beyond for us and made sure that even when the Rose was the first thing to go, I still managed to grab a glass. Rava Wines, Lauren Rava. Rava Wines was honestly like walking into my perfect dream winery... I remember running into the drive way and I started crying tears of joy the first time we visited. I knew the second we parked that I was going to get married here( Derek knew it too). Lauren was an absolute dream to work with and the winery she has built with her family is stunning. She and her team were so responsive and easy to work with throughout our planning process. They made us more and more excited as our day approached and were so excited to host us. The wine is also DELICIOUS. We served the Rose, the Albarino, the GSM and the Brut sparkling. Absolutely stunning and great examples of the growing ability of the Paso Robles wine region. When you and your soon-to-be husband are standing up at the altar, take a moment and turn to face your guests together. In that moment, you'll realize how truly special your love story is and how every minute of planning this day has been worth it. Derek and I had gotten this advice from a friend's dad and added the moment to our ceremony. I remember turning and seeing all of my favorite people, in my favorite place in the world sitting there to celebrate Derek and I. It was one of the moments that I talk about to people as the moment that it really hit me how special this day really was for us and truly put us in the moment.